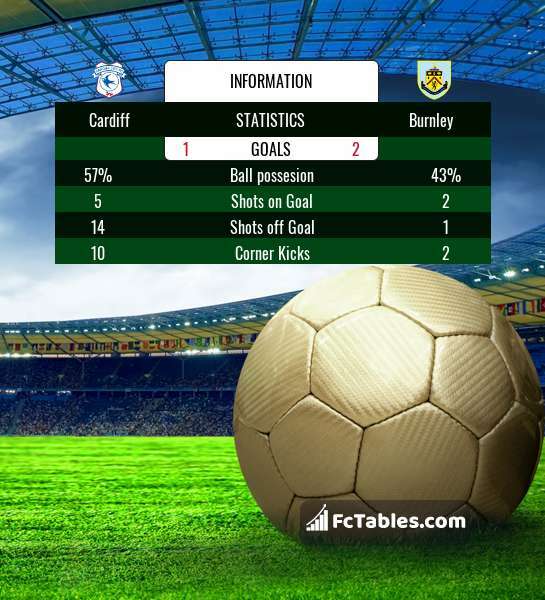 The match Cardiff-Burnley Premier League will start today 15:00. Referee in the match will be Martin Atkinson. Team Cardiff is in the releagtion zone of the table. 19 position. In 5 last matches (league + cup) team gain 2 points. Leading players Cardiff in Premier League is: Danny Ward 1 goals, Souleymane Bamba 1 goals, Victor Camarasa 1 goals. In Cardiff not occur in the match due to injury: Lee Peltier, Aron Gunnarsson, Nathanial Mendez-Laing. Team Burnley currently is on lower place in table (17 position). Burnley in 5 last matches (league + cup) have collected3 points. The best players Burnley in Premier League, who scored the most goals for the club: Ashley Barnes 2 goals, James Tarkowski 2 goals, Aaron Lennon 1 goals. Players with the most assists: , Aaron Lennon 1 assists. Direct matches: Cardiff won more direct matches. Cardiff won 8 matches , Burnley won 3 direct matches, was a 11 draws. In 9 matches the sum of the goals both teams was greater than 2.5 (Over 2.5), and 17 matches teams scored more than 1.5 goals (Over 1.5). In 12 matches the both teams scored a least one goal (Both teams to score).